Paul Refsdal’s latest film DUGMA: THE BUTTON hasn’t even been released yet and it’s already causing a stir. The original feature film documentary which follows a group of suicide bombers working for Al Qaeda in Syria, was originally picked up by four broadcasters but due to its controversial nature, has come up against some opposition with the director choosing to distribute the film online instead. Ahead of its official release on iTunes on 2 August, Donna Kelly caught up with the director Paul Refsdal to discuss his inspiration behind the project. Refsdal’s film presents an unbiased picture of four Al Qaida “martyrdom seekers”, each waiting for their turn to “push the button”, known by Jihadis as ‘Dugma’. The 52 year-old who has spent more than three decades covering conflict around the world, says he wanted to show the “real lives” behind the people regarded by many as dangerous terrorists. “I wanted to do something about Al Qadia group in Syria because they are regarding as among the worst enemies we have. I knew that Jabhat al-Nusra had a good reputation among other groups so I knew that they should be a story there of how they really are on the ground” explains Refsdal. The vast majority of the film focuses on Abu Qaswara al Maki, a Saudi soldier who has spent two years on his militia’s most exclusive waiting list. The 32-year-old left everything he had including his wife and two young children to travel to Syria and join Jhabat al-Nusra. During the film, Qaswara is called up to complete his final mission with Refsdal filming his final moments as he enters the vehicle. “He [Qaswara] was supposed to go on the mission to blow himself up just after I left in December but somehow he failed to go on the mission” explains Refsdal. Remarkably, Qaswara’s mission was cancelled when the road he needed to travel down was blockaded. Qaswara talks openly about his disappointment of failing to complete the mission, which the day after, is given to another fighter. Another character in the film is Abu Basir al Britani, a 26-year-old white British citizen who converted to Islam while living in Egypt. 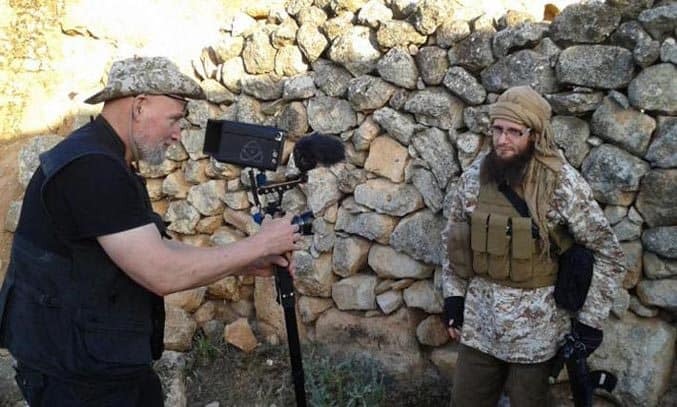 Basir, formally known as Lucas Kinney, made headlines last year when he emerged in a series of propaganda films for Al-Qaeda, calling for Muslims to join the terrorist group in the fight against Islamic State (IS) and the Assad regime in Syria. Basir is also on the list of martyrdom seekers but after three weeks as a married man he receives the news that he might become a father – something that for the first time makes him doubt that Dugma will be the right thing for him to do. Refsdal spent a total of six weeks embedded with the Nusra fighters during 2014 and 2015. The director went to great lengths to portray the characters not just soldiers, but as human beings with weaknesses, faults and self-doubt, which heavily relied on trust. “Abu Qaswara was very open from the first day, but everyone else was a little bit reserved” explains Refsdal. The soldiers certainly open up, talking willingly and without censorship about their faith and their wiliness to make the ultimate sacrifice. In the film’s opening scene, Abu Qaswara shows us around his heavily armored suicide truck – complete with 27 barrels of explosives – pointing to the innocuous little red button in the dashboard that he intends to push when he reaches the enemy. In another scene, Abu Basir and his two Syrian companions engage in conversations about Islam as sniper bullets repeatedly strike the outside of the building they are sitting in. It’s a constant reminder of the immediacy of the war yet despite this, Refsdal remains remarkably calm about his experience. “I got bombed a couple of times. I stayed there for 6 months so of course you get bombed a few times. The other thing was of course, the kidnappings. When I was there at the end of 2013, Islamic State was very active in the area so I was going around dressed like a Jhadi and my translator was telling everyone that I was a Chetan snipper to not make me attractive for kidnap”. “I had a couple of times were I had some people making trouble with me, asking questions and getting a little bit more aggressive. Both times they were Chechens but it sorted itself. The first time because one of them knew my name from Chechnya, they knew that I was OK. The second time when I was with Jhabat al-Nusra, they called one religious leader and he came down to the place where we were stopped by the Chechens and he just basically told them that they were stupid, that no-one comes with a big camera to film you secretly. It is a situation that can escalate, then they arrest you and if you are arrested, by definition you are guilty and you are a hostage”. Terrifyingly, Refsdal is no stranger to being held hostage. The Norwegian journalist was kidnapped by the Taliban in 2009 during the making of his last film, TALIBAN BEHIND THE MASKS, which was shot behind enemy lines. Surprisingly however, the experience didn’t deter Refsdal from embedding himself with Nusra, an experience which brought him face-to-face with the preparation and execution of terrorist attacks. Yet, despite the film’s unprecedented access to Al-Qadia, Refsdal has found resistance to his film from major broadcasters, choosing instead to distribute his film on iTunes. Yet despite the difficulties with distribution, Refsdal remains passionate about the project. DUGMA: THE BUTTON is released worldwide on iTunes from 2 August 2016. Read our review of the film here.